Sometimes I can hardly believe that this is really my sixth pregnancy. This is really the sixth time that I have cried tears of joy seeing a heartbeat (or two) on that giant screen in my doctor's office. This is the sixth time that I have fallen asleep dreaming of the perfect name for the little life in my tummy. This is the sixth time that I have held my breath in hopes that our little baby will make it into our arms at FULL term! Although I have done this pregnancy thing six times, and there have been some aspects of pregnancy that have hit me in a similar way every time, each pregnancy has also had it's own journey. With the twins, it was our first pregnancy. I found myself questioning every movement. I got BIG fast! And I experienced my biggest lesson to date, in letting go. Josiah's pregnancy can be summed up in a single word, Worry. I went to the doctor excessively to say the least. And all that worry was followed by one of the absolute greatest joys that I have ever felt, when I held him, ALIVE, in my arms for the first time. Hal was our glorious surprise! I got pregnant with her six weeks after I delivered Josiah. I worried in a different way with her. Getting pregnant so quickly with her I feared that I might lose her. And then when I realized she was staying with us for the long haul I felt overwhelmingly joyful. I kinda felt like the Lord was giving us back the twins that He had just recently asked us to let go of. 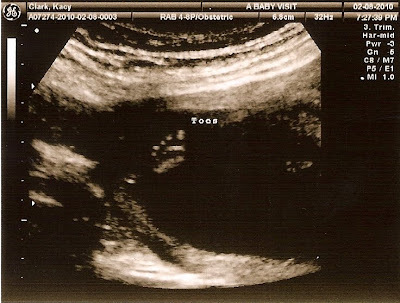 Three months after Reesie arrived, pregnancy # 5 was the shortest pregnancy yet. Short, but very sweet and dear to our hearts. We had to learn to let go again. 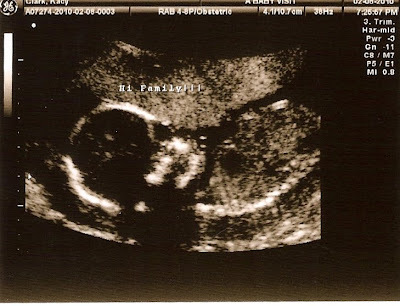 And here we are now... pregnancy #6. This pregnancy has had it's own purpose. I have been craving turkey sandwiches, BBQ chips, Coke, and Welch's yogurt covered blueberry fruit snacks that I can only find at Target. With our insurance situation I have had to learn to trust the Lord with this little one. I cannot go to the doctor as often as I am used to going. I have been growing very slowly. I am sixteen weeks already and have only gained 2lbs. I can still wear my normal clothes. I have worried and then felt peaceful... then I worry again... then I trust... it seems to be a never-ending battle in my heart. My dear friend Heidi connected me with a pregnancy resource center near my house and they weren't able to do much for me there. 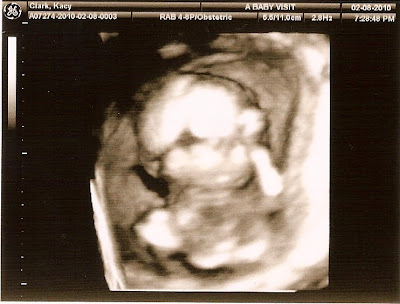 But they were able to connect me with a high-tech ultrasound place where I could go to see if the baby was indeed growing and to see all the baby's little parts, hear it's heartbeat, and make sure that it is forming properly... all this for only $50!!! So we went last night... and it was AMAZING!!! 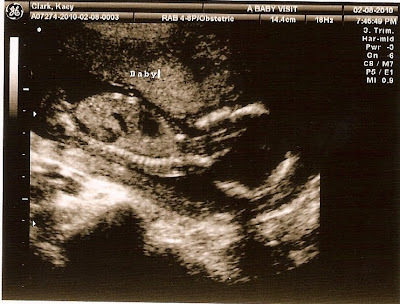 They have this massive screen that covered the whole wall and we could see the baby and every last detail of it's body as if it was outside of my tummy. And the best part is... IT LOOKS PERFECT!!!! Everything looks great at this point. By now I know better than to say anything other than, "If the Lord wills it," we will be meeting this little bundle of joy in July. The truth is that Joey and I are just pathetic when it comes to waiting to find out it's gender. We made it all the way to birth with Reesie. But now, the fact that we waited with her is going to be another special part of her story because last night we totally found out that we are VERY CLEARLY HAVING A BOY!!!!! There is no mistake here! There is a little boy in my tummy! We don't yet have a name. And in all honesty it might take us till he's born to come up with one. We have absolutely no runners-up as of now. If you've got any ideas please feel free to send them our way. So that's the update on this precious gift of pregnancy #6! We have high hopes that sixth time's a charm!